Each year the WMC holds a competition for music camp scholarships and monetary prizes. It is open to any student in Charlottesville and Albemarle County, as well as those who study with WMC members. Applicants must be recommended by their music teachers. The Annual WMC Competition is held in the late winter, and winners perform at a recital in their honor in March. Last year’s competition (2018) was held at First Presbyterian Church where a total of 43 young musicians competed for 18 monetary prizes and music camp scholarships. Seven distinguished judges spent up to 8 hours listening to the performances, carefully rating each soloist. A total of $11,400 was awarded to the winners in 2017. Congratulations to the 2019 WMC Competition Winners! All Senior winners, all Junior Camp winners, Senior Camp winners, as well as the first place winners in the H.S. 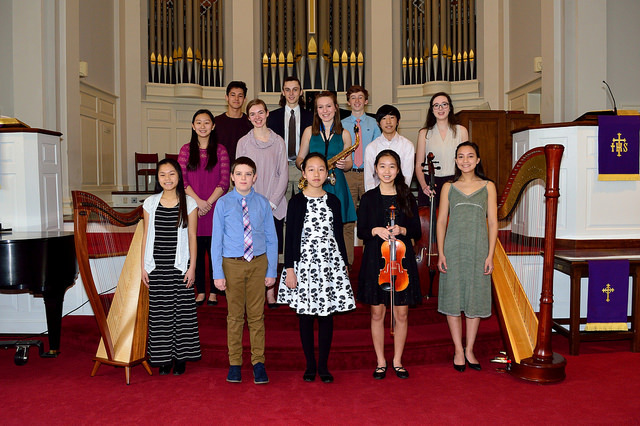 9th, 10th, and 11th grades will perform their pieces and receive their prizes at the WMC Competition Recital on Sunday, March 3rd at 2:00 PM at First Presbyterian Church in Charlottesville. The composition winners will receive their prizes in the mail except for the first place winner who will attend the Winner's recital prepared to either play their piece, have someone else play their piece, or have a high-quality recording to be played over the church sound system. Copyright © 2019 Wednesday Music Club.